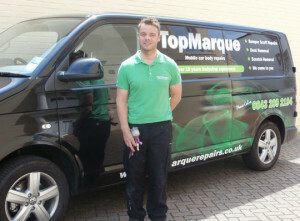 Top Marque Repairs specialise in mobile car bodywork repair, car dent and car paint repair in Littlehampton, Sussex. Dents and scratches in your car make your vehicle look tatty. This can affect your vehicles resale value. We repair cars in Littlehampton and the surrounding area. We come to your house or place of work to fix your car. This saves you time and money whilst we restore your vehicle to its previous pristine condition. We have over 21 years body shop experience and are Mazda approved paint technicians. Click on the following link to see some example of the cars we’ve repaired. We don’t just repair cars in Littehampton. We also fix cars in Surrey, East Sussex and Kent. We service from Worthing to Eastbourne to Crawley. We come to you serving Littlehampton and the rest of Sussex. Its important to get paint scratches repaired as soon as possible. Not only do they look unsightly but left longer term they can lead to rust problems. Rather than taking your car to a costly body shop, one call to Top Marque Repairs and we will come to you. We fix the problem onsite often within a few hours. Cars can pick up a number of dents and dings through their life. We fix both minor and major dents in cars. If you’ve been putting off getting them fixed give us a ring. You may be pleasantly surprised at our prices. We repair plastic bumpers back to their former glory. We do this in a matter of hours. Scuffed and curbed alloys are commonplace. Good news is we fix these as well, often is as little as one hour. 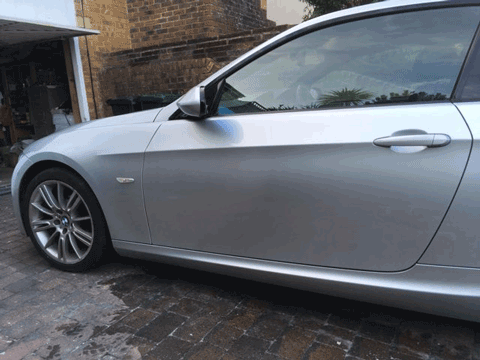 We are proud of the fact that we have over 18 years bodyshop experience which means that our knowledge and understanding of car paint repairs is second to none. We pride ourselves on being reliable, efficient and producing the highest quality of work. Looking for a bodywork specialist you can trust to carry out thorough and speedy repairs? Looking for a lower cost, lower hassle factor? Use the form on the right hand side to contact Top Marque Repairs in Littlehampton now. My Mercedes ML had a nasty dent on the off side rear wheel arch. Neal did a great job in repairing the damage and respraying to a point where you would not know it was there. Good, reliable and courteous service, certainly knows his stuff! Thanks Neil. Will deffinatly recommend you to my friends. 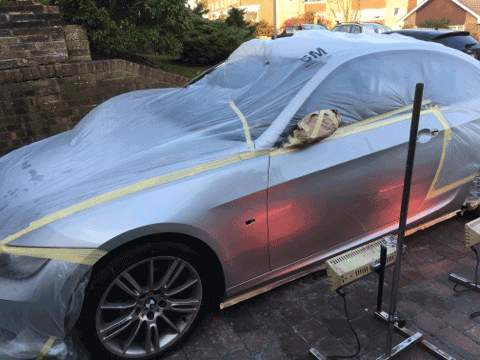 The finishing touches on a silver BMW 4 series. The heat lamps in the first picture are used to cure the paint and speed up drying times so you can get on your way as soon as possible.